The following girls have been completing community service in order to achieve their Lions Young Leaders in Service Awards and we would like to congratulate them on their wonderful achievement and contribution to the community. 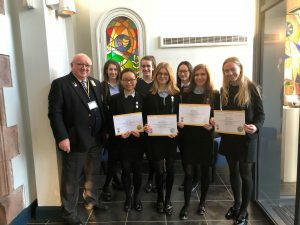 We would also like to thank the Crosby and District Lions Club for their continued support of the school and in particular David Winsland for giving up his time to come into school to present the awards to the girls. Freya Dodgins, Emily Storch, Ellen Jones, Shuyi Wu, Milla Kops, Harriet Oakes, Emily Woodier, Hannah Evans, Lucy Chen and Charlotte Hulme.